Milk was an inspirational story that certainly needed to be told and it was told pretty well, but it could’ve been told just a bit better. Milk was directed very well and made a story that could’ve been very long and slow into 2 hours and pretty decently paced. The pacing was working really well for about an hour or so and then it began to lose its flow that it had going, but by the 3rd and most important act, it picked up again with a very moving final 15 minutes. Milk is the story, if you don’t already know, about the life and times of Harvey Milk. Milk was the first openly gay man elected into major office. He was elected as a supervisor in San Fransisco in 1978. Its the story of the many times he ran, the speeches he made, and his eventual win with his time in office and the cruelaty he had to face because of the kind of person he was. The movie is much better, the less you know about it, so that’s all I’m giving you. You’re not going to find much better acting than this by a full cast of characters. James Franco was a very good supporting actor as Milk’s original boyfriend, while Jame Brolin just keeps getting better. Brolin plays another city supervisor opposite Harvey by the name Dan White. 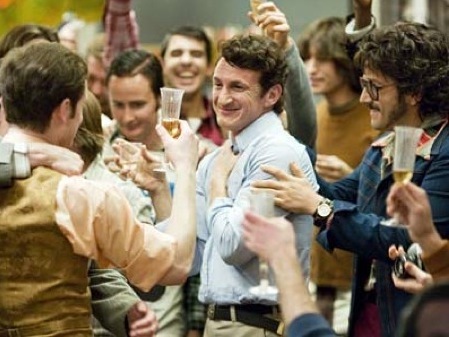 The movie, though of course, belongs to Sean Penn who was absolutely spectacular and a very convincing Harvey Milk. Penn will most certainly be nominated, but I don’t believe he will win due to other running mates. Unfortunately I must say that I believe that if he does win, it’ll only be because of the inspirational character he’s playing. Milk is a must-see. It’s a tale that must be told and a tale that must be known. It wasn’t as good as it could’ve been, sure, but it was also a lot better than it could’ve been. Milk isn’t the greatest movie of the year, no, not even close, but it was one of the most important. The reason this is true is because its a movie that takes place in the 70s, but it’s on a topic that still hits home for a lot people today. This entry was posted in All, Movie Reviews and tagged Dan White, Harvey Milk, James Brolin, James Franco, Milk, Milk Movie Review, Milk Review, Sean Penn. Bookmark the permalink.